I have a score in 12/8 time which is counted in 4 groups of 3, not 3 groups of 4 in my case. Weirdly enough the pickup measure has 4 12th counts. And musescore connects the first 3 nodes with a common banner rather than the final 3, as shown in the first attachment . However, it works fine in a normal measure as shown in the second attached image . Notice how the last 3 notes are tied with the common beam. How can I change this in the pickup measure? By applying the correct beams from the beam palette. * Select first note, double click "No Beam"
* Select the 16th, double click "middle"
* select the last 1/8th, double click "middle"
@geetee, it seems, from my experimentation, that the icons don't do what they are labeled to do. I was able to edit the beam of the first note . I used the beam menu . However, I'm stuck about what to do next. 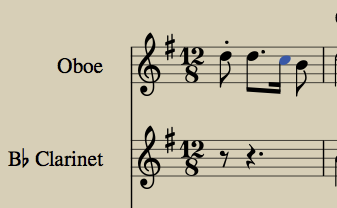 How can I force a beam between the last two notes in the measure? Thanks Jojo, I was already looking at these options. But I don't see which one does the trick. OK, got it. I made it work . I dragged the "Start a second level beam at this note." icon over the LAST note of the measure. And it works now. That's not very obvious from the description. That "do not end bar at this note" on the 2nd to last didn't do the trick? No, "do not end bar at this note" has no effect. I tried selecting the note and double clicking the icon. And I also tried dragging the icon onto the note. No effect. I wonder if the functions (C++ functions) are connected to the wrong icons? The beams do exactly what they say they will do. You don't understand how they work. Hi Mike, I had a node which ended the beam. I clicked on "do not end beaming on this note" and that DIDN'T end the beaming. To me that says, the effect is not what the label says. But when I clicked "start a second beam level at this note" it create the single beam that I wanted. My score is in time signature 12/8. My pickup measure has 4 1/8th counts. The default beaming connected the first three 1/8th notes and let the 4th stranded. It should have connected the final 3 1/8th notes and left the first one stranded. Since you are using only pictures I can only guess what you might have done wrong. To make a note beam to the next note, you must click the next note and change it to Beam Middle. This is what the context help (words in the yellow box) calls it. This will enable it to connect to the previous note. There are only three reasons a note does not connect to the previous one. 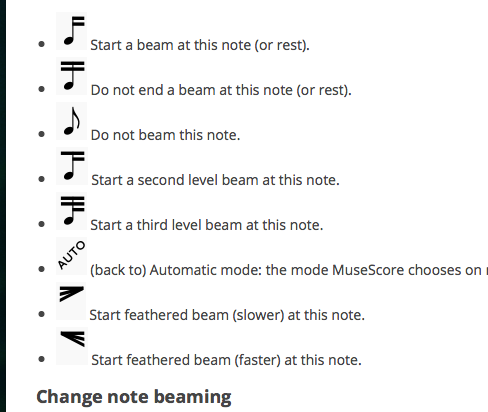 The previous note is set to "No beam"
The next note is set to "No beam"
The next note is set to "Beam start"
There is technically a fourth reason and that is that the time signature has set one of these beaming properties and either you did nothing or reset them to auto. If you want a better explanation of what you are doing wrong, select the first two measures and use the menu File->Save selection and attach the new file here. Or you can just attach the whole score, I can find the first two measures easy enough. Thanks Mike for offering to help. I'll attach the score. I made the dotted 8th "Beam Start" and the last 8th Beam Middle. If you look at the time signature properties (right click time signature and choose Time signature properties) you will see this is how the last 4 8th notes are set up. You have to do a little counting to see this, but count from the right not the left and it will be easier. The first 8th note is irrelevant since the second one starts a new beam. 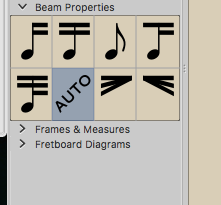 For the record - the icons are correct, and you don't need second level beam settings at all here. Probably you messed things up with your experimentation. Try again with everything set back to Auto. All you need to do is use "Beam start: on the dotted eighth and "Beam middle" on the last eighth. On a very related topic, IMHO you should not need to do this. The problem is the beaming algorithm used in pickup measures. 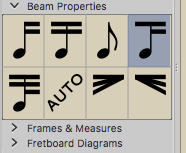 Rather than using the last x number of beats to beam a pickup measure, it uses the first x beats to beam the measure. You should logically get the beaming you want by default. Hi Mike, I had the same impression. that it is counting up from left to right, but it should be counting down from right to left. it is a minor issue of course, except that users with small brains like me can't figure out how to edit the beams. Yes, I agree. The problem is we don't special case "pickup measure", and actually for most other places where a measure has an actual duration different from nominal, what we do does make sense. It will mainly turn out to be wrong for pickups or measures that were split in two for whatever reason (to insert a mid-measure repeat, to start the second half of the measure on the next system, etc). Ideally, we should probably try to special case this based on, hmm, maybe "for measures at the start of a system, work backwards"?